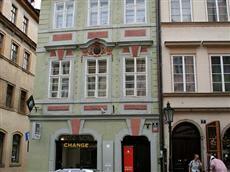 The only Prague hotel in The hot 100 best hotels in Europe 2010 by The Sunday Times. Design boutique hotel Domus Balthasar is situated on the Royal Route, in the heart of the oldest and most romantic part of Prague - Lesser Quarter (Mala Strana), few steps from Charles Bridge, close to Old Town and also Prague Castle. The hotel has 8 rooms including 2 double attic rooms, 3 generously spacious deluxe double rooms, 2 suites with kitchenette and 1 royal room. Breakfast is served from 7:30 until 10:00 in Bohemia Bagel Cafe. The Bohemia Bagel offers a variety of delicious baked goods and more, e.g. : homemade bagels, a variety of soups, salads, sandwiches, full breakfasts and more. Rooms are cosy and comfortable, varying in size and shape. Thoughtful details and clever touches can be found in each room such as timber beamed ceilings.